Detroit Lions quarterback Matthew Stafford was stranded on the Southfield Freeway on Friday after a truck struck a pedestrian bridge causing it to collapse onto the roadway. A spokesman for the team said that Stafford did not witness the 6AM bridge collapse but was among the motorists stranded by the incident and was within yards of the accident. In what might be considered an occupational hazard of playing for Detroit, a city rapidly falling into disrepair, Stafford traveled on his way to practice when the overhead bridge collapsed. The driver of the truck was killed in the accident. Traffic was backed up for miles on both sides of the freeway as a result of the incident. 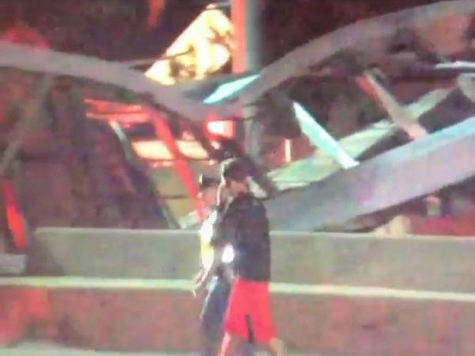 The player was photographed by another driver as he walked past the collapse and the image was posted to Twitter by Fox News 2 reporter Roop Raj. Michigan State Police spokesman Lt. Michael Shaw told the media that the 60-year-old truck driver might have survived if only he was wearing a seatbelt. Only one other car on the road was crushed by the collapsing bridge. The driver of that vehicle was not seriously injured. Michigan Department of Transportation spokesperson Diane Cross reported that in May the bridge was inspected and received a “fair-to-good” rating.